Around the Pacific Northwest, planting for a fall vegetable garden really needs to be done by mid to late July, however there are still some edibles you can plant now for some tasty fall eating. 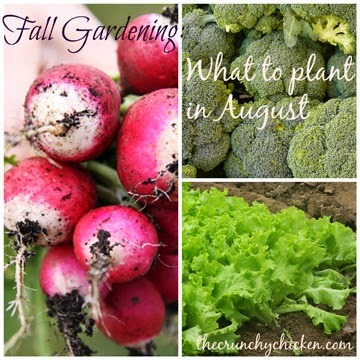 I've had a couple conversations with friends and neighbors in the last week about what to plant now to keep their garden growing so I figured I'd make a post on what to plant in August for a fall garden. I know it's the middle of summer and even thinking about planting for fall food crops in the middle of all the beans, cucumbers and tomatoes sounds insane but, if you're like me, and you wait until the end of August or early September to get around to it, you'll be too late. So, consider this a friendly reminder! This is kind of it, for the most part. The only other things I'll be putting in the ground over the next few months will be more lettuce. And garlic and fava beans for next year. Before you get too far along, now's also a good time to add some organic fertilizer to your already established edibles to keep them going. And remember, since it's so warm and dry in August (even in rainy Seattle), you'll want to make sure you keep any transplants or seeds well watered. What are you planting now for a fall garden in your neck of the woods? I love hearing about who's growing what in other areas of the country. One of my Facebook readers from California is playing around with papaya starts! Shoot! I gotta get my cauliflower going!! Where did the time go? Thanks for the reminder. GB - I think you have a little more wiggle room where you live, no?